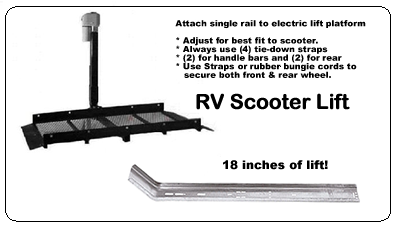 Electric Power, RV Motorcycle lift and carrier for Motorcycles & Scooters ~ "Lowest Cost" Electric Lift for Rvs & Motorhomes anywhere! Electric lift for Motorcycles & Scooters up to * 650 lbs. like Honda Helix, Suzuki Burgman or Yamaha Majesty! This motorcycle or scooter carrier let's you load safely at ground level. It will work with Hitch Receivers to a height of 20", which is great for SUVs and RVs. Once you have secured the scooter to the carrier, push the switch and your scooter raises to cruising height. The carrier plugs into your Class 3 receiver or stronger and requires a 2" X 2” square receiver. This electric lift has a Heavy-Duty Motor for Motorcycles & Scooters up to *650 lbs. Safest Loading Scooter Lift Available - * With attachments: Fold Down platform, rail with front wheel stop, outrigger tie down points on platform. * Capacity is 300 lbs for single receiver. * Scooters have off-centered loads, because the engine is mounted toward the rear end. 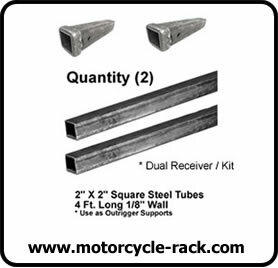 * Please remember to purchase & install the Dual Receiver Kit. * Required for Rough Road / Applications also. * To help support the front and rear of the heavier scooters. 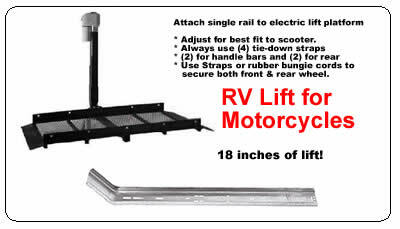 Click Above Picture for Motorcycle Lift!